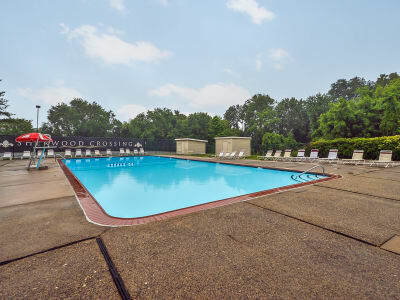 With a long list of fantastic amenities, a helpful and friendly staff, and a great location, there’s no better place to call home than Sherwood Crossing Apartments & Townhomes in Philadelphia, PA. Our studio, one, two, and three bedroom apartments and townhomes offer expansive floor plans, full-size washer and dryer, and plenty of upgrades. Prepare delicious dinners in our available upgraded kitchens, including granite counter tops, whirlpool appliances, and maple cabinets. Enjoy the freedom that comes from spacious floor plans, large closets, and kitchen pantries in select floor plans. When it’s time to improve your fitness, complete a workout in the fitness center or check out the outdoor fitness stations to switch up your routine. When your dog needs to expend some energy, take her to the convenient onsite dog park. When it gets warm outside, unwind with a few laps in our sparkling swimming pool, or just soak up the rays as you lounge by the water. Your new life awaits at Sherwood Crossing Apartments & Townhomes. Call our leasing team today to set up a personalized tour of our Philadelphia, PA, apartments and townhomes.